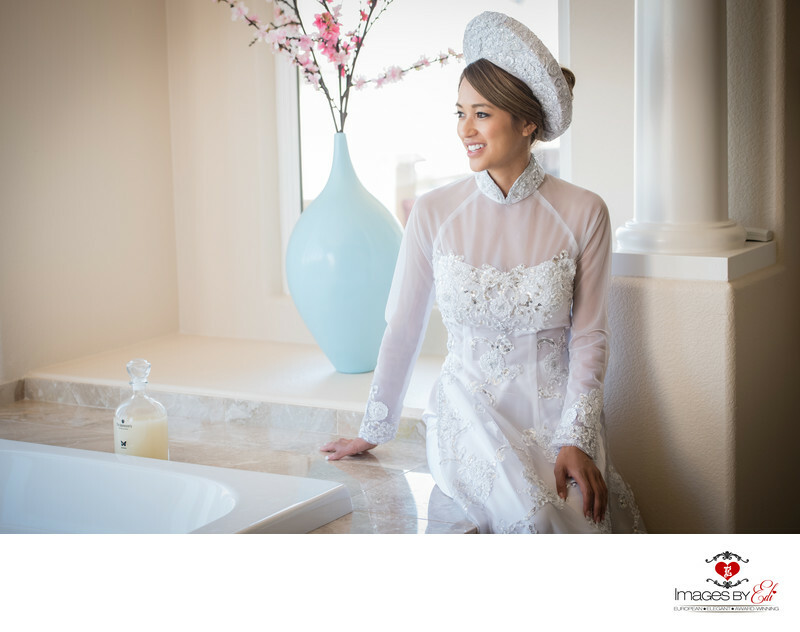 Vietnamese bride in her traditional dress before am Hoi and tea ceremony the day before her Mandarin Oriental Las Vegas wedding. Ao Dai is the traditional Vietnamese dress with various patterns and her headpiece, the Khan Dong, what she wear for special occasions. The Le Dinh Hon, or the engagement ceremony took place the day before the wedding. It can also be referred to as the Dam Hoi which translates to the asking party, where the groom and his family asks the bride’s family for their daughter’s hand in marriage. The bride’s family dressed up the house with flowers and lampion and also there was a lot of food, what that the guest eat after the ceremony. The groom’s family and the groomsmen traveled from their hotel room with a limousine and met down the street from the bride’s home. Than they walked down to the brides house lead by the groom’s parents then the groom, carrying trays called Mam Qua. During this whole time, the bride stayed upstairs, than when everybody arrived walked down to start the event. After burning incense and bow to the altar for approval from the bride’s ancestors, the ring ceremony, the tea ceremony to the parents and grandparents than lunch followed.